Although we have heard quite a bit of buzz surrounding the Android 4.4.3 update, there really hasn’t been anything concrete released in regarding what exactly will be included in this update to the OS. However, as promised by Google, the OS is always expected to receive two updates per year and with the Google I/O rapidly approaching, the evidence for Android 4.4.3 is everywhere. Last month, news was released in regards an update coming to the Nexus 5 which would provide a bunch of bug fixes for the device. However, Google hasn’t officially made any announcements in regards to this news. Also in April, we had two other curious events transpire. One was an update to the Google Edu Device Setup on the Play Store, indicating that it now compatible to run on devices with Android 4.4.3. The other clue was in the leak of the redesign of application icons and the new UI dialer new stock Android. 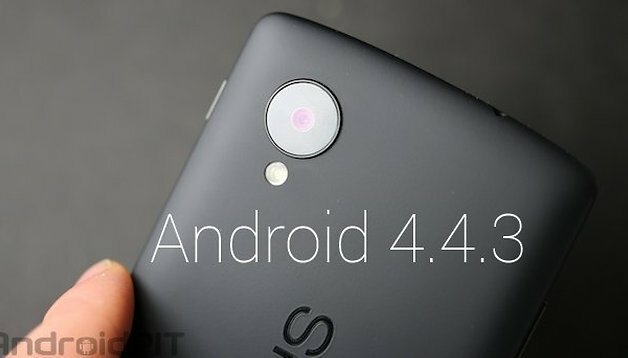 As such, taking into account that there has been a ton of indicators pointing towards the arrival of a new version of the Google OS and that by all indications that it will continue with the naming convention of KitKat, it is time to ask ourselves: what can we expect from Android 4.4.3? Android 4.4 unfortunately released a plethora of different bugs across multiple devices, most notably Google’s own Nexus line. Unfortunately, not all of these issues were resolved with the Android 4.4.2 update. Bugs such as a frequent loss of network connections, freezing on the lock screen, misrepresentation of data usage graphs, LED not functioning properly and more should see themselves corrected in the next update. Moreover, we can also expect the miscellaneous issues with MMS, e-mail clients, calendar, contacts, issues with the camera software (both with regular focus and HDR modes), bugs related to Bluetooth, USB, Wi-Fi, ringtones and more all have the possibility of seeing themselves remedied with Android 4.4.3. While we don’t expect major UI changes with Android 4.4.3, we’ve come to expect that at least the stuff under the hood will get a nice tweak. Asides from bug fixes, we expect new features to show up in Android 4.4.3. Although we stated above that there won’t be any major UI changes, leaks have indicated that there will at least be a few in the form of an updated stock dialer and contact list for Android. Google is also following a different direction in relation to native Android services, such as the keyboard and camera. Recently, they released the camera software via the Play Store and offered non-Nexus users the chance to download the stock camera software. As well, this allows Google to incrementally update the camera application without having to release an OTA update to the operating system. Finally, in recent weeks we have seen massive updates to the Google line of applications, with special devotion to Google Now, which can help you find your parked car, can be used in conjunction with the reminder service Keep, and also information stored offline. However, Google Now isn’t the only one that has been getting all the update love, Google Maps also started offering better services with an improved offline mode and more. With the leak of the new icons pack for pure Android, we see the move towards a more pastel look in Android 4.4.3. As a matter of personal taste, this might not sit well with everyone as we see Android move towards the same direction that the LG Optimus UI is taking and following suit with the likes of iOS and Windows 8. It will be curious to see whether Google will keep GEL as a native application for the Nexus / Google Edition line of devices or will ultimately release the APK officially on the Play Store for all to enjoy. First, Android 4.4.3 will be rolled out for Nexus devices and we should see a timely roll-out, possibly up to three weeks later, for the Google Edition line of devices. Depending on manufacturer schedules and how long it takes themselves to get organized, it could be week or months after that before you see the update rolled out across non-Google related handsets. If you’re curious for a list of possible devices that should be getting Android 4.4.3, check out our article on the subject. With the typical pattern of Google’s update schedule, we won’t see a major update to Android prior to the release of Android 4.5, or surprisingly enough, Android 5.0. We could expect this type of release to most likely occur with the release of a brand new device, possibly the Nexus 8, and shouldn’t be expected any time before October to November of this year. As such, Android 4.4.3 will be concentrated around making a more stable Android experience and fixing various bugs and issues. Do you think Google will surprise us with the next update of Android or do you think they’re going to stick to fixing the small stuff?